Short-term economic outlook remains solid. However, the flattening of the yield curve signals mounting risks in a medium-term perspective. Data on the housing market due over the week should confirm that the growth rate of the sector is weakening. Data due this week should not impact next week Fed's monetary policy decision: a 25bp rate hike to 2-2.5% is a done deal. The ISM manufacturing confidence index for August, up from 58.1 to 61.3. 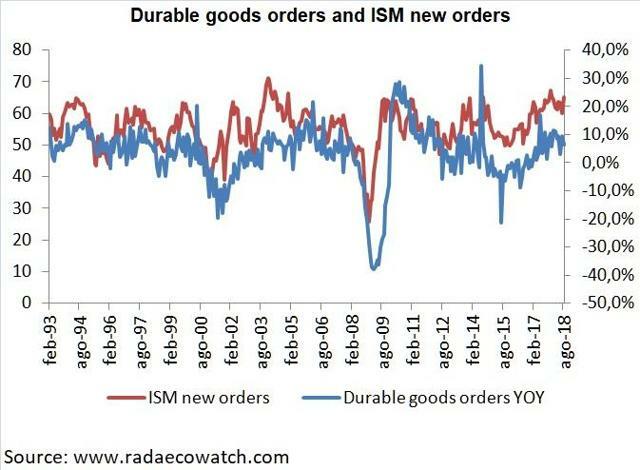 The new orders index also rose from 60.5 to 65.1, strengthening the positive message of the headline index. At 61.3, the ISM is at a value in line with GDP growth of 5.6% according to past relationship between the PMI® and the overall economy. The NFIB small business confidence index rose in August to its highest level ever, strengthening the message come from the ISM manufacturing confidence index. The trend of the labor market. In August non-farm payrolls rose by 201k, with the unemployment rate at 3.9%. Moreover, wages grew by 2.9% y/y (it was 2.7% in July), increasing the possibility that consumer spending could grow at 3-3.5% pace in the coming months. Industrial production expanded by 0.4% m/m in August, exceeding consensus expectations for an increase of 0.3% m/m. Only retail sales provided negative indications, with an increase in August of 0.1% m/m, lower than consensus expectations for a 0.4% m/m increase. 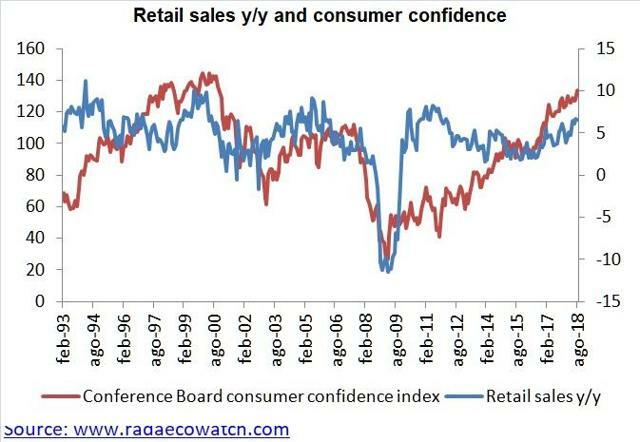 However, the improvement of wage growth trend and the surge in consumer confidence (the University of Michigan consumer confidence index rose from 96.2 to 100.8 in September) suggest that the positive trend of consumptions could resume soon. In this scenario, we believe that the U.S. economy can continue to expand at 2.5% pace in late 2018/early 2019. However, in a medium perspective, signs of caution come from the flattening of the yield curve. The spread between 10 year and 2 year government bond yields dropped to 20 basis points over the last few weeks, increasing the chances of recession in the next 12 months. According to the Cleveland Fed recession probability model, which use the spread between 10 year T-Bond yield and 3m T-Bill, the chances of a recession rose to 18.8% in August (from 15.2% in June) and according to the New York Fed model to 14.6%. During the week of 17-21 September, the focus of investor will be on economic data on the housing market. 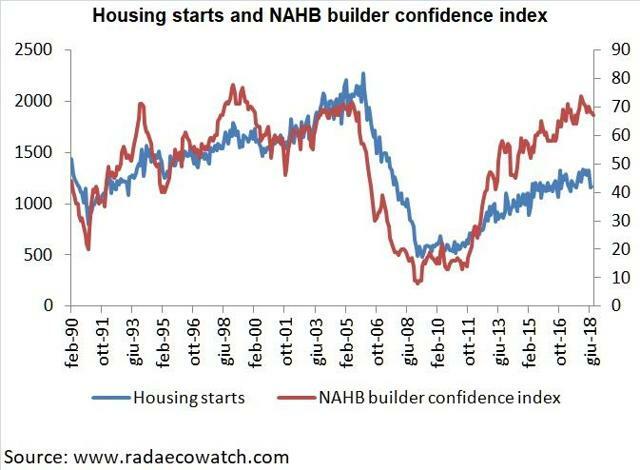 Having been weak during the summer (they fell to 1168k in July from 1329k in May), housing starts, due for release on Wednesday, September 19, are expected to rebound by 5.7% to 1235k. The figure would confirm the slowdown of the growth rate of the housing market signaled by the decline of the NAHB builders' confidence index. Having touched a high of 74 in December 2017, it declined 67 in August. The September data due on Tuesday, September 18, should see a further correction to 66, indicating that the slowdown in the real estate sector should continue in the coming months. Other relevant data due for release over the week are NY empire manufacturing index and the Philadelphia Fed for the September, which will provide the first clue on the trend of manufacturing confidence ahead on the release of the ISM manufacturing index, scheduled on October 1st. Anyway, the data to be published this week should not impact the Fed's monetary policy decision at the end of 25-26 September meeting. Indeed, the Fed should raise rates by 25 basis points to 2-2.25%, confirming the base scenario of another 25bp rate hike in December and of further three rate hikes in 2019.